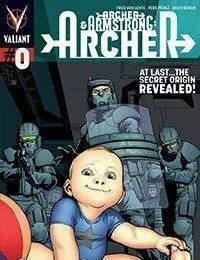 Once upon a time...a baby went into Project Rising Spirit...<br />Who is Obadiah Archer, where did he come from, and how can he do the incredible things that he can do? (Which is everything, remember?) Fresh off the shocking conclusion of the Sect Civil War, learn the startling truth behind Archers origin with an exciting look into his secret past by Valiant superstar Fred Van Lente and fan favorite artist Pere Perez!